One Chair is an interactive video installation. The project is shown in a large rectangular room. 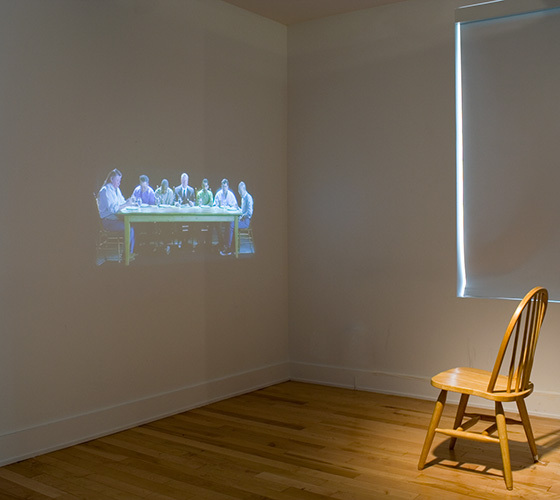 One short wall has a life-size projection of seven men of various ethnicities eating at a long table. Each individual is eating rice; except for the man in the center who is eating steak, potato, and beans. The composition is based on Leonardo’s The Last Supper. In the center of the installation space is a solitary chair. Participants entering the space have the option of sitting on the chair or standing somewhere in the room. If the viewer chooses to sit on the chair, his or her presence slows the eating of the men, except for the male in the center. After approximately twenty minutes, the single white male will also slowly stop eating. By virtue of his or her engagement, the viewer has brought all the men to the same level of influence. A short while after, they slowly begin eating again, speeding up until they eat together at a regular pace. At this point the cycle seamlessly resumes. One Chair is about social engagement. When a participant actively engages he or she can create change, for example sitting the chair. If a participant takes a passive engagement, then change happens slowly. A camera above the chair sends video of the entire room to a computer. A custom computer vision tracking algorithm searches for participants and their locations. When a visitor is determined to be within a hotspot, video playback changes accordingly. Additionally, there is a sensor on the chair to aid the vision algorithm with participants near or sitting in the chair. The video is comprised of two movie files composited together in realtime to give the effect of separate speeds. Original source footage was shot in HD1080i and minimally modified to retain as much resolution as possible.